In the Precision edit box, type in the number of digits to the right of the decimal point of the length value to be displayed alongside the segment. In the Height edit box, type in the text height for the displayed segment length text value. (If Absolute is picked) In the Angle edit box, type the angle to use when the segment length text is drawn. Absolute - This will create the segment length text at the specified angle(set in the Angle edit box). Parallel - This will create the segment length text parallel to the line segment. 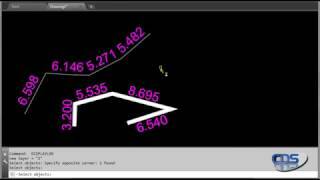 Perpendicular - This will create the segment length text perpendicular to the line segment. In the Offset Distance edit box, type in a value for the distance between segment length text and the selected polyline segments. In the Layer list, select a layer in the current drawing to drawn in the segment length text on, or pick *New Layer* to create a new layer and color. Pick the Create button and a prompt appears. PROMPT: Select objects: Pick single or multiple polylines (Select or Window) and press <Enter> and the segment length text will be placed. The prompt repeats and can be used to select additional polylines, or press <Enter> to exit.